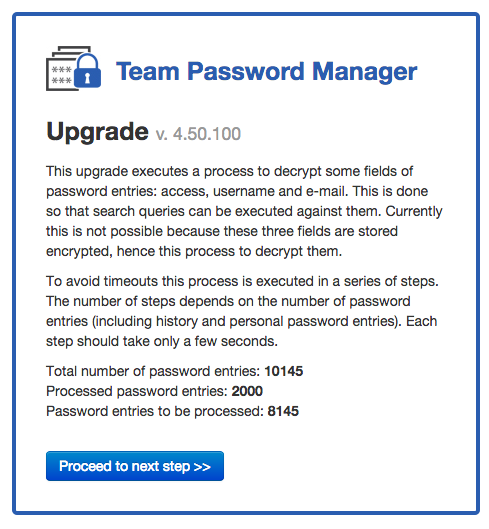 Today's new release of Team Password Manager (4.50.100) tackles something that lots of users have been requesting since the beginning: being able to search access, username and e-mail in passwords. Until now, these three fields (access, username and e-mail), for better security, were stored encrypted in the database. The problem was that it wasn't practical to do searches on them because this would entail loading all of them, decrypting them and then doing the search. It's possible to do this with a few passwords but with hundreds or thousands of them it would take forever. The solution is of course to store them in plain text, unencrypted. If you need to have them encrypted you can always put them in encrypted custom fields. The password field will remain stored encrypted, obviously. So when you upgrade Team Password Manager to this newest version you'll run a process that decrypts these three fields. Specifically it will decrypt the access, username and e-mail fields of passwords, password history and my passwords. Since this could take long for lots of data and could result in a timeout that stopped the process we've made it execute in steps, processing about 2000 passwords in each step. 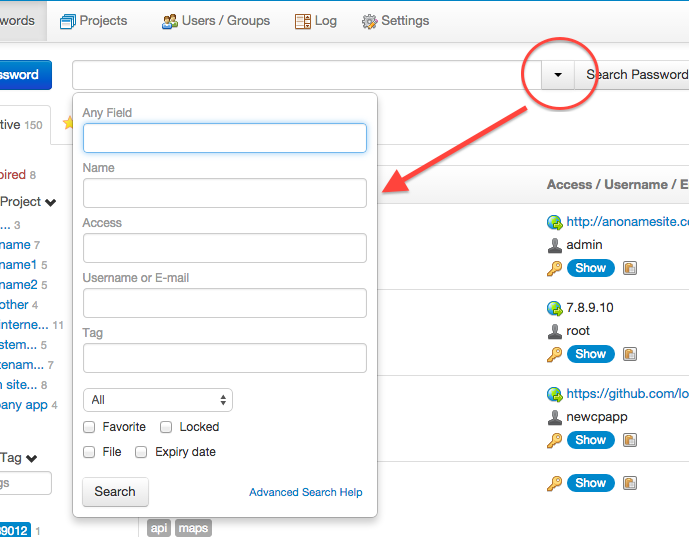 In this release we're also introducing advanced search operators and an advanced search form. name:ftp => will find passwords that have "ftp" in their name. file:.pdf => will find passwords that have pdf files (one or more). username:[root] => will find passwords that their username is root (and only root). We've created a document that fully explains search operators, please go read it: Advanced search operators. Export and import: users can now export and import my passwords to/from a CSV file. Delete all: it's possible to delete all the personal passwords of a user in one step, which should come handy for example when importing. API access: the new API v3 has a resource to work with my passwords. We've created two new parameters that go in config.php that will allow you to send the log to the system logger (syslog) or to a file. Please read about them here: ADDITIONAL_LOG / ADDITIONAL_LOG_FILE. The new API version has support for my passwords, a new resource to get version information and some additional features. Check the change log for all of them. We've been working on adding hierarchy to projects (for better organization) and a finer permissions model for passwords and projects, but it's not ready yet. We hope to have it ready for the next release and that should be around April. Go read the Change log for the complete list of changes and bug corrections.